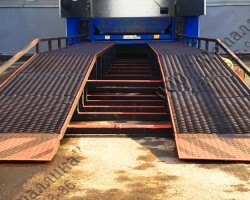 The ramps are designed for low tonnage vehicles. They elevate the floor of a vehicle to the level of the existing ramp (as a rule, a height of 1.2 m). Auto-ramps are essentially two tracks consisting of the horizontal part of the specified height and the ramping incline. They are made as an integral unit, though the design can be changed to a separated one, in the form of skids. Standard auto-ramp load capacity is 5t. 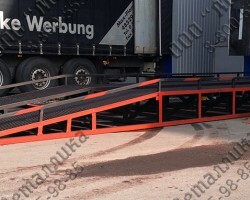 These ramps are not produced with wheels, but can be easily moved through the territory by a forklift. All MLC АР Range ramps have the normal overall length and width. Shipment is possible in the vehicle of the customer or by a hired transport company. 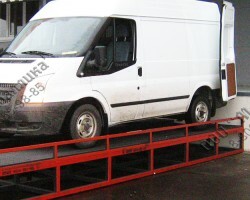 Our managers arrange delivery of any ramp directly to your site through proven logistics companies and at a good price. Delivery is carried out in all regions of Russia, CIS and Europe countries (see the geography of deliveries through the link: Link). If you are ready to provide your own transport for shipment, then the loading is done by our company and is absolutely free! Manufacturing of light-duty truck ramps takes only 3 working days!